While we're waiting for Duke Nukem Forever to finally come out (it's been in development since early 1997), a trilogy of Duke Nukem games is coming to Nintendo DS and PSP this fall. 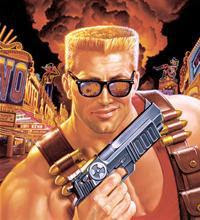 And to promote 'em Apogee and Deep Silver are holding a nationwide contest to find someone to pose as a real-life Duke Nukem. According to the story at USA Today: "The contest will travel to New York, Los Angeles and Dallas seeking out potential Duke Nukems. As the press release describes, 'aspiring Dukes will be judged on how well they personify the character's take-no-prisoners attitude.' The winner will be revealed during the Electronic Entertainment Expo in June." Blast here for the official website of this gimmick. And if you've never had the politically incorrect pleasure of playing a Duke Nukem game (or you have already and can't get enough of Duke's crude humor) GOG.com has Duke Nukem 3D: Atomic Edition for purchase and download - and guaranteed to run on Windows XP and Vista machines - at the great price of $5.99!